Have mini-anchors available (2.4mm). See manufacture links for available anchors. Supine position with hand table. EUA compare to uninjured side. 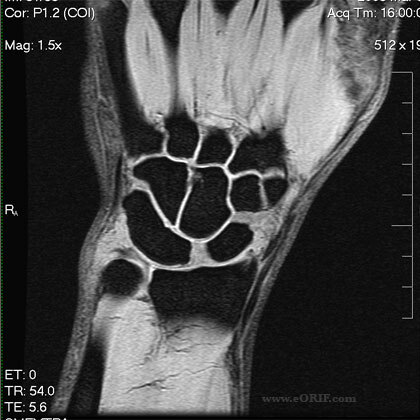 Consider Wrist Arthroscopy to confirm diagnosis and examine for arthritic changes. Repair the capsule and extensor retinaculum. Long-arm splint in pronation for 4-6 weeks, with frequent follow-up xrays to assess reduction. Consider occupational therapy if stiffness continues 8 weeks.